Celebrating the life of Thomas Braxton Miller, Jr.
Obituary for Thomas Braxton Miller, Jr.
Mr. Thomas Braxton Miller, Jr., 58 of Clayton, formerly of Raleigh, died Tuesday, September 25, 2018 at UNC Hospitals in Chapel Hill. Mr. Miller was born September 27, 1959 in Wake County to the late Thomas Braxton Miller Sr. and Lola Belle Lee. He was also preceded in death by his aunt, Darothy Grove. 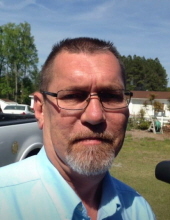 Mr. Miller attended Smithfield-Selma High School and Enloe High School prior to serving in the US Navy. Mr. Miller served during Operation Desert Storm during the Persian Gulf War and later in the US Navy Reserve. Mr. Miller worked for Caterpillar in Clayton. Graveside services will be held 2 p.m. Wednesday, October 3, 2018 at Devotional Gardens with Rev. Lawrence Pounds officiating. Mr. Miller is survived by his mother, Lola Lee Holloway of Clayton; sisters, Sherry Miller Gowler & husband Alan of Clayton, Kim Miller West of Dunn; nieces, Carolyn Lee Edwards & Zoe Elizabeth Williams.Visitation will be held at 1 p.m., one hour prior to the service at Skinner & Smith Funeral Home in Dunn. Memorials may be made to Sharon Baptist Church, 116 Britt Street, Smithfield, NC 27577. To send flowers or a remembrance gift to the family of Thomas Braxton Miller, Jr., please visit our Tribute Store. "Email Address" would like to share the life celebration of Thomas Braxton Miller, Jr.. Click on the "link" to go to share a favorite memory or leave a condolence message for the family.